This tutorial, which takes about ten minutes, steps you through creating and using Analysis reports, and will (hopefully) give you an appreciation of what they are and how they can be used. Although designed to be used with the “Acme Widgets” tutorial file, you can use this tutorial with your own accounts if you want—there are no side effects (but you will obviously get different results). 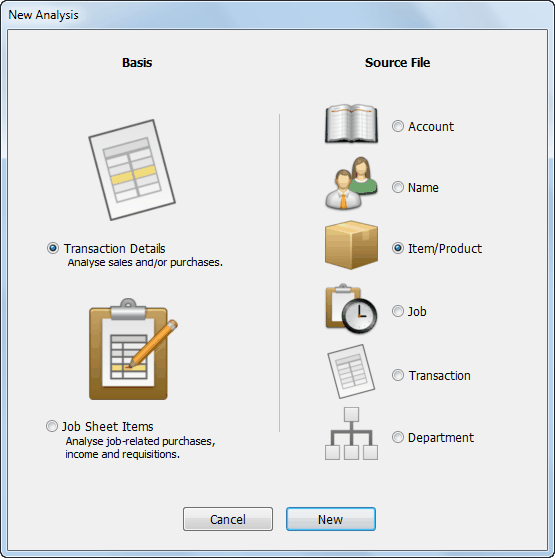 Analysis reports can provide information from either the transaction file or the job sheet item file, both of which hold “raw data”, and hence can be usefully analysed. 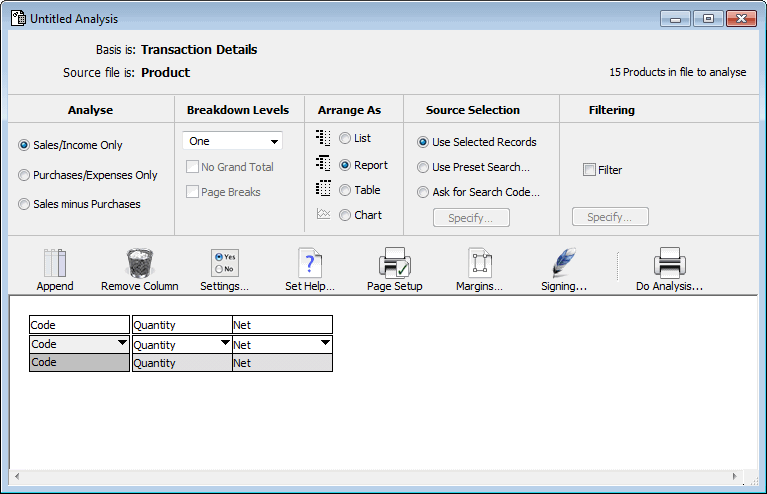 In this tutorial we will use the transaction file to create an analysis report to show who has purchased specific products. The New Analysis window will be displayed. An analysis report is always based on a Source File, which is used to select the transactions to be analysed1. In our example, we want to report on sales of specific products, so the product file will be the source file. The Basis indicates where the information that we are analysing comes from. For this tutorial we want the transactions. The Analysis Definition window opens. In this window we can specify the information that we want to appear on the analysis, and how the report will be formatted. As this analysis is concerned with who purchased the selected products, we only want to look at sales. This determines how the information is displayed in the report. The bottom part of the window displays the structure of the analysis. The fields on which the analysis will be done are in the left hand columns. The default setting has one label column called Code. The remaining columns show the information that will be printed, and are currently set to Quantity and Net. We’ll look at the default report, even though it is not quite what we want. 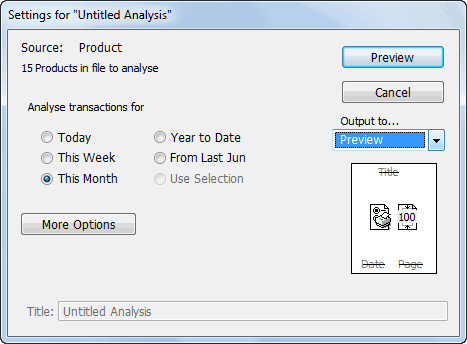 The Analysis settings window will be displayed. We use this to select the output options and time interval for the analysis. If your’s does not look like the one above, click the Fewer Options button. We’ll look at all sales for the year to date. The analysis report will be displayed. For each product, found all details lines in transactions that occurred this financial year. Added up the quantity and net for the detail lines. The summary information for that product was then printed. The analysis setup window will be the front-most window.